Track Lengths OVER 9 FT long come are more than once piece and with a splice kit. You must DRILL your Own holes in the Standard Track to line up with your studs. 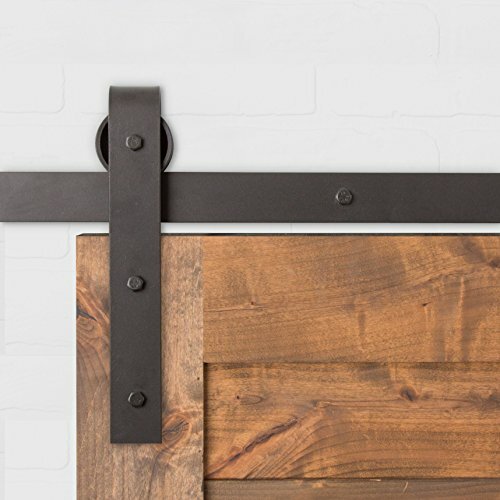 Includes EASY to UNDERSTAND INSTRUCTIONS: And a DIY How To Video on YouTube "Barn Door Hardware Installation and How-To | Artisan Hardware". Ultra DURABLE strength: Can support doors up to 400 lbs comfortably. Manufactured in the USA with UNMATCHED QUALITY and CUSTOMER SERVICE Here in Kaysville, Utah. SATISFACTION GUARANTEE: 100% Money Back Guarantee if you're not satisfied with this product. We now use the Highest Quality Powder Coat Available.